Running coach Derrick Simon (centre front) goes through drills with participants of the Kenyan Running and Multi-Sport Camp, held at the Peake Training Grounds, Cocorite. At back centre is professional runner and coach Timothy Limo who is in TT to host the camp. TIMOTHY Kipkorir Limo (Timo Limo), professional Kenyan 800metres runner and head coach of the Lornah Kiplagat Sports Academy at the High Altitude Training Centre of Iten, Kenya is in TT. 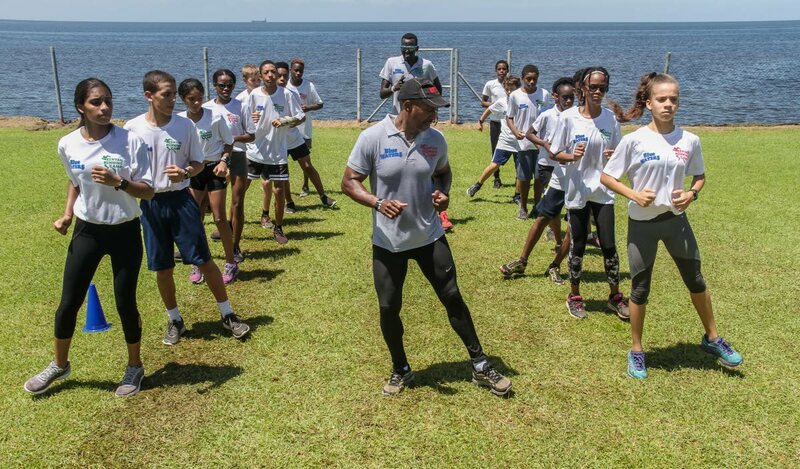 The highly sought after specialised coach in speed and technique has partnered with local triathlon clubs to host the week-long Kenyan Running and Multi-Sport Camp at the Peake Training Ground, Cocorite. The camp catered three sessions for boys and girls under 15 years old and two sessions for adults this week. Timo Limo was assisted in the sessions by a highly- qualified local triathlon staff of Derrick Simon, Nathalie Lafont, Jonah Camps and Derek Daniel. Reply to "Kenyan pro runner in TT for multi-sport camp"